The Sonorous is a state-of-the-art digital audio recording and playback device designed to provide a continuous-play audio source for message-on-hold, background music or any other audio application where high-quality audio playback is required. The audio program is loaded from a CD burned as a DATA CD with standard MP3 files onto high-density flash memory using a pure digital-to-digital file transfer. After loading audio, the CD can be removed and audio plays from the 8Ω or 600Ω RCA output jack. The Sonorous has a base storage capacity of 16MB of flash memory which can be used for message-on-hold or shorter message applications. If longer memory capacities are required, the Sonorous is available with 512MB of flash memory storage. 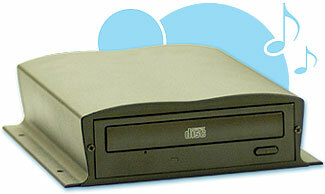 The Sonorous supports CD media that has been burned as a DATA CD using many 3rd party programs that are available today. For ease of use the Sonorous also supports the Windows XP and Windows Vista burning applications that are included as a standard part of the OS. The Sonorous is also available with the optional Sonocrypt Level 3 encryption technology. This technology enables dealers to protect customers units against unauthorized loading of MP3 files. Each Sonorous is built to exacting quality standards using state-of-the-art assembly equipment for outstanding reliability and years of dependable service. RESET - The RESET button clears audio stored on memory when held during power up. Note: Audio is automatically erased when changing CD media. SPEAKER - The SPEAKER switch can be turned ON and OFF to monitor audio. The switch has no effect on the audio OUTPUT connections. Switch should normally be kept OFF. VOLUME - This pot is used to control the output level of the stored messages. Volume up is clockwise, volume down is counter-clockwise. OUTPUT - These RCA jacks supply the audio output to a MOH port, PA system or speaker. STATUS - The STATUS indicator is a multi-colored LED that will indicate the current operation of the unit. POWER - Use this switch to turn the unit ON and OFF. 15VDC - This is where the supplied 15VDC @ 1.67A power pack is connected.